"Everybody was in shock," fashion designer Göksen Hakkı Ali told The Dodo. It's unclear where the cat had come from, but her motives were pretty obvious — she wanted the full attention and admiration of the audience. And judging from her adorable little attacks on the models passing by, those weren't things she was willing to share. 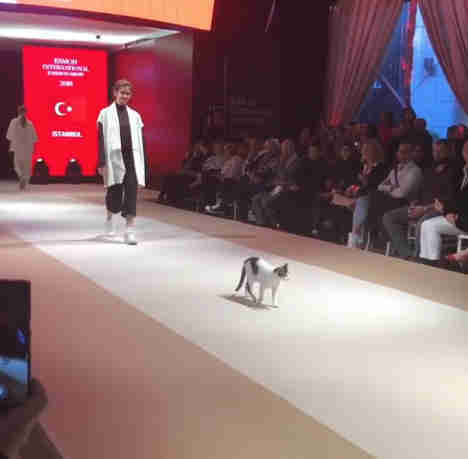 Sure, the rambunctious kitty may need to tone down her cattiness on stage, but she's definitely got the runway strut down pat. When asked if the aspiring model feline could have a future in the fashion industry, Hakkı Ali admitted that it can't be ruled out. "Haha, maybe," she said. "Why not?" Talent like that is certainly hard to pass up.